Bill McKibben, author and environmentalist, poses for a photo after his lecture on “Updates From the Front Lines of the Climate Fight” at McKenna Theatre at 2 p.m. Thursday, Oct. 16, 2014. Amanda Peterson / Xpress. 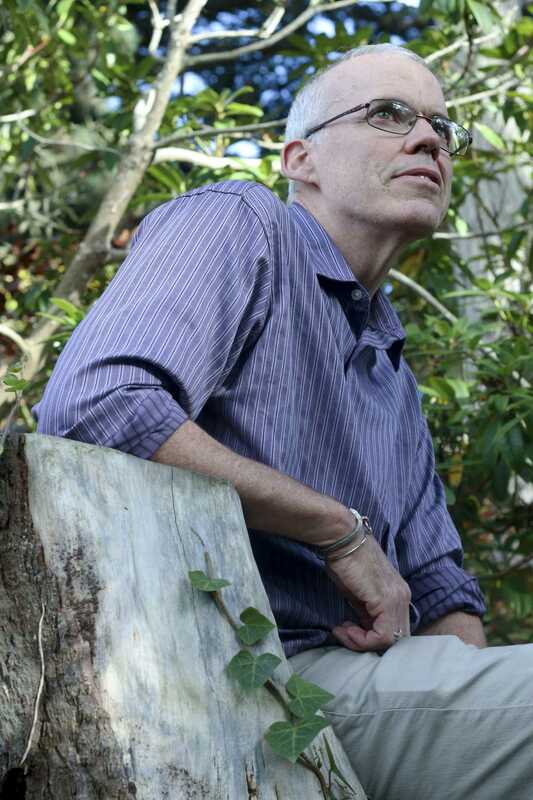 Best-selling author and outspoken environmentalist Bill McKibben lit a fire underneath SF State students Thursday with a lecture on climate change and the global fight for environmental justice. SF State’s environmental studies department invited McKibben to lead a discussion on 350.org, an international climate movement that seeks to incite change through globally coordinated grassroots campaigns. During his lecture, McKibben celebrated SF State’s divestment efforts over the past year, and encouraged the audience to get involved with local groups. Twenty-five years ago this month, McKibben published the first book about climate change for a general audience. Raised in rural Vermont, he developed a strong attachment to nature at a young age, and that bond defined the next two decades of his life. According to McKibben, the incredible power of the fossil fuel industry, the richest industry in human history, is to blame for the United States government’s latent response to climate change. Human beings, and especially modern humans, are responsible for driving climate change through behaviors that force carbon into the atmosphere, thus trapping more heat, according to McKibben. He also said climate change is responsible for a 30 percent increase in acidity in the planet’s oceans, a massive decline in the amount of snowpack in the Sierra Nevadas and the intense drought in California. For McKibben, changing individual behaviors isn’t enough anymore – people have to organize. “Ten years ago it dawned on me that writing another book just wasn’t going to move the needle on this issue,” McKibben said. Kelsey Anderson, a senior in the environmental studies program, said she was inspired by the comradery behind the climate fight. Anderson works with The Green Initiative Funds, a student-run program that is working to attain subsidized transit passes for SF State students. TGIF is one of many student groups on campus. The 700 seat McKenna Theatre was full with students and environmentalists from around the Bay Area, who mingled before and after the event. Imani Davis, a 22-year-old transfer student from Sacramento, found McKibben’s humble demeanor refreshing. She said it was nice to see a normal guy like him get up to speak, despite the massive challenges the movement faces. “I think his message to everyone is that we all need to be out there and we can do something really important because I know a lot of people get stuck at the facts because it’s daunting – it’s very daunting,” Davis said. Despite the emphasis on grassroots organization, Davis found the facts and data about climate change to be the most moving aspect of the lecture. McKibben said he did not expect the pace of change to trudge along as it has in the 25 years since his book “The End of Nature” was published. “No, somehow I thought that if all the world’s scientists sounded the alarm, the world would take notice. Silly me,” McKibben said.